It’s here! The icy breath against your neck makes you wonder what you ever did to justify this sort of evil punishment. Winter, It’s here and there is no avoiding it and for those of us who live in cold climates (like here in Alberta) and have Solar Panels integrated into our chilled existence, it’s inevitable we get questions about snow, cold temperatures and short winter days. One of the most intriguing questions is about the cold. Many people logically relate the sun to heat and immediately think Solar panels can’t possibly work when it’s cold outside. In reality the cold weather actually creates ideal conditions for solar arrays by helping them work more efficiently. PHEWW! This is one topic that generates an amazing amount of discussion! If a picture of a Solar Power System is posted online, especially of a roof top installation, many, many comments follow: “Good luck removing snow” “What a waste – zero generation when covered with snow” “Waste of time – no generation in the winter” and on and on. On the surface this seems like a fair observation. When you absent-mindedly found yourself standing in front of the TV, did your mom ever tell you: “You make a better door than a window!” Well that’s what snow is to your panels. A door in front of your PV panels that cuts down on your ability to produce power. But in reality for those of us with a grid tie system, snow actually has little bearing on very much. You spent the 3 “better” seasons collecting sunlight, converting it into electricity, feeding it into the power grid and ultimately rolling your meter backwards. The gains you made during those glorious warm days, offset your lower production in the winter. The below chart, using NASA solar insolation values, shows that in the winter, 10.07% of annual generation is created. The spring generates 31.70%, the summer 39.32% and the fall 18.91% of annual values. That means a solar PV system will generate 89.3% of its energy from Spring to Fall! So, now we get down to the question of, “Is it worth cleaning the snow?” If we assume there is 0% generation in the winter, we only lose 10.07% of annual generation. What about real world results? During the winter, we will still have some generation. And, during the spring and fall, we can still get snow, so how can we determine what will happen in the real world? Well, thankfully NAIT Polytechnic out of Edmonton has been very pro-active in this area and has built a “reference array” for this very study! 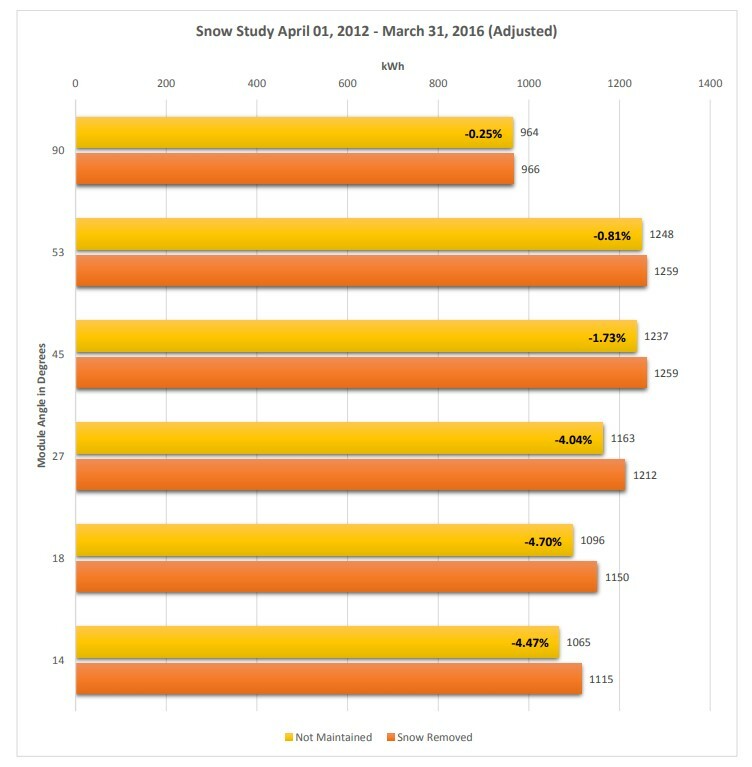 So, this data is invaluable as it proves the effect of snow on a solar PV system. If we look at a typical 4/12 pitch roof, at 18 degrees, real world data shows by removing the snow only 4.7% additional solar generation is realized! Currently, there are no snow clearing technologies available that would be a cost effective method of capturing that extra 4.7%. What about manually cleaning? Sure, if you have a ground mount, with easy, safe access, then cleaning those modules off will most certainly allow you to easily capture that extra 4.7%. To see the real time Enphase data for the reference array, please click on the below image. To review the official Nait report, please click here. Now, on the other hand, the Off Grid people have a much closer relationship to their power generating system as this is often your only power source. You quickly learn to sweep your panels off as part of your routine when it has snowed - fill the bird feeders, sweep the snow off the panels, shovel the doorstep. It’s not a big deal, but a vitally important one if you are going to watch travel shows about tropical destinations on your flatscreen! Now daylight hours is probably the one thing you simply can’t get around. There is no stretching the day longer like you can sweep the snow away. Those brief daylight hours do limit ones’ ability to harness power. This is where the Off grid people have it dialed. Efficiency is the name of the game. Not that you are doing without power (as long as your system was sized correctly!) It means you are not wasting power and having to dip too deeply into your battery system. You get into a rhythm with the sun and the seasons. An intimate understanding of your consumption of power and its effects on your immediate world is inevitable. Once again the Grid tie system shines in the winter, you did all that Solar harvesting and now you can simply let the power grid be your main power source until those days get a bit longer. Not to say you are not able to offset some of your power bill in the winter, but it certainly helps to have the power lines there! We hope you enjoyed this blog post! If you have any questions about this post, or any other topic, please contact us as we are happy to chat! Now, is it Spring yet!? !